I love dystopian novels but it's easy to get burnt out on them -- bad worldbuilding, cliche characters, predictable plot twists, and unconvincing love interests are all things that have totally thrown me out of what should have otherwise been a story that I loved. So I understandably get a bit nervous when I pick up a new one that I've been highly anticipating. Is it going to let me down? Am I going to wind up blogging about how annoying the book was? Get burned enough times and those are the questions you start to ask yourself. 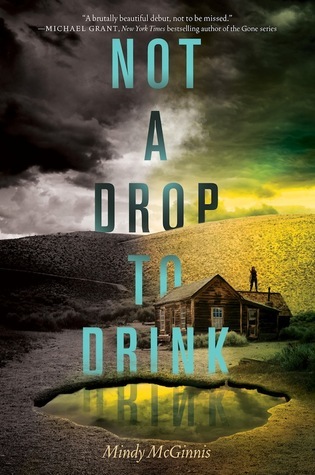 Well, I am beyond pleased to say that I loved Mindy McGinnis' Not a Drop to Drink. I think I loved it most because it felt different from most dystopian novels. There's nothing paranormal or supernatural -- just a world running out of water, where those rich enough to pay for water are kept safe in walled-up, strictly managed cities, while everyone else has to fend for themselves. The characters aren't superheroes, or genetically modified in some way, or even particularly brilliant, they're just real people doing their best to survive. Taking away super advanced technology, zombies, or mysterious illnesses makes Not a Drop to Drink feel like a more human story, and even though its characters are often gruff and anti-social, I still feel like it's a world that I can envision happening. The story drops us right into the middle of Lynn and Mother's world, where they have to protect the lake, their only source of water, at all costs. You gradually begin to see that Mother's a very hardened woman and that this has rubbed off on Lynn, who has interacted with very few other people in her life. They're women of few words, but they are tough and smart and capable and will mess you up if you come for their water. Oh, boy, will they mess you up. Lynn's character arc and growth in this book is excellent and very well done. She goes from only having Mother, to having to learn to let all sorts of other people in. Including, yes, a love interest, which happens quickly but worked for me as it was just another way that showed Lynn having to learn to coexist with people other than Mother. It's rough going, and Lynn can come across as rude and callous, but solitary survival is all she's known for so long that change doesn't happen overnight. Watching her learn to take pleasure in simple things, like telling a joke or playing in the snow, is a joy to read about. And while I don't want to spoil anything, there are some events in the story that are downright brutal that I didn't see coming. Shocking events aren't exactly anything new in books, but the things that happen here are just rough and hard to take, in the best sort of "but I was so invested in that" way. I think it's because everything here felt so real and familiar that it was easier to identify with Lynn and her isolated, rural upbringing and difficulties interacting with other humans. I don't think this book is for everyone. For about 98% of the book, the universe is very bleak and depressing, and the characters are tough, emotionally, which could make them harder to relate to. It's more a story of survival than a non-stop action-packed adventure. I was frequently reminded of The Road, or at least the bleak atmosphere that the book is set in. This is an excellent debut novel from Mindy McGinnis and I can't wait to see what she comes up with next. I love shocking events and I don't mind bleak, depressing stories. It reminds me in that aspect of The forest of hands and teeth. It's nice to finally have a dystopian that is truly a dystopian! Absolutely! I loved that this was a dystopian that didn't veer off into sci-fi (not that I don't love sci-fi). It was a book about people, and what people can do to one another. One of my favorites of the year! Is this a stand alone then? Yep, as far as I can tell -- the ending wraps everything up pretty neatly. I wouldn't mind reading more, but it's a pretty self contained story. I can't wait to read Not a Drop to Drink. I already preordered it, and I'm waiting anxiously until it comes. So far everyone, who read this book, has enjoyed it. I don't mind a good survival story, and I'm glad you talked about the main character. For me, I really don't like reading about an underdeveloped character, so it's good to know she grows throughout the book. Yay for a positive review-I only skimmed your thoughts since I haven't read it but I have a copy and am looking forward to giving it a read! I know what you mean about dystopians but your review definitely has me looking twice at this book. I did just read a depressing one so I might need some time but this one is going on my TBR list.